With Insecticon Kickback, any bot is vulnerable. The Decepticon has a knack for winning and luring in allies. But like a poisonous sting, Kickback quickly turns on them, blackmailing them into doing his dirty deeds. You know, over the course of the Generation 1 cartoon series, Kickback surely got shafted. 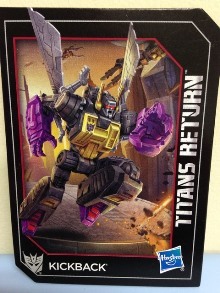 Part of a trio of Insecticons, Kickback has the weakest powers of the three. Shrapnel, the leader, gets to manipulate electricity. Bombshell has the ability to control others� minds. Kickback, while a smooth talker, has� strong legs and blackmailing capabilities. How did that all work out? Debuting in the first season of the original cartoon (A Plague of Insecticons), the Kickback and Insecticons have been kicking around (har har) ever since. They�ve done some neat things during their time, but Kickback was simply a part of the team � not truly contributing anything noteworthy. He did, however, meet a ghastly �end� in Transformers: The Movie when Kup crushes his head front and center on screen. Somehow he made a comeback in Season 3 with a handful of appearances. Maybe his hidden skill is immortality? Kickback was the only Insecticon I had the chance to own as a kid in the 1980s. He was a favorite figure of mine, and one of the few that had lasted through playtime during my adolescence. I believe he got lost in the shuffle of a garage sale many years ago when I wasn�t collecting, so a few years back I purchased the Toys R Us exclusive Platinum Edition reissue set � which was nice (I reviewed that one here), but the stickers on mine would just not stay put. I ended up selling the set off when Hasbro announced plans to make modern versions of the toys, starting with Thrilling 30 Shrapnel. In the midst of the Generations Shrapnel and Bombshell releases, I picked up Fall of Cybertron Kickback (which I also reviewed here). A nice toy for sure, but it�s outside of the Generations aesthetic and way out of scale (Deluxe vs Legends). Either way, Titans Return Kickback is not perfect, but it�s nice to have a complete, modern set of Generation 1 styled Insecticons. Kickback�s alternate mode is that of a robotic grasshopper. 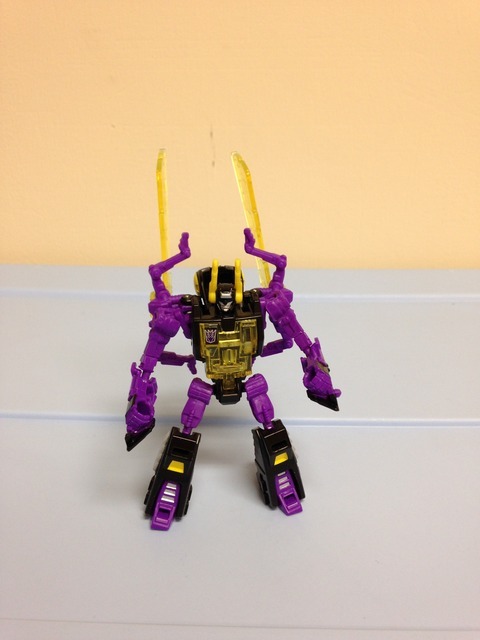 As you would expect from the G1 Insecticons, Kickback�s color palette consists of black, purple, and yellow (some of it being transparent), with some silver accents here and there which are painted or tampographed on. What�s interesting here is that the yellow and purple coloration differs from that of Shrapnel and Bombshell. At first thought it is kind of irritating, but in some weird way it makes sense with Kickback. With Shrapnel coming first followed by Bombshell (who didn�t match at all), I�m glad Hasbro made the choice to make them all different. Had they stuck with the shades of either one or the other, you would have one odd Insecticon out. As it is, the difference in colors across the three makes more sense (aside from matching all three). Kickback is right in scale with the other two figures, and aesthetically (molding, not color) flows right along with the other two Insecticons. He�s pretty close in design to the original Kickback, albeit with modern updates. The rear legs have a little bit more range than previously, as do the wings. The head seems a bit overly large to me, but that�s because the grasshopper head is actually a helmet for the rather small robot head. The two heads share some rubbery yellow antennae. The top of the insect back is transparent yellow plastic and functions as an opening �cockpit� to house a Titan Master as a driver. It�s more like just a seat for riding, as once the Titan Master is in there, you can�t close the top. It�s a neat little function that adds some play value to the insect mode, and also as a funky little nod to Kickback�s pre-G1 Diaclone days. Other than that, Kickback essentially does nothing else in grasshopper mode. Compared to his wavemate Gnaw, the Kickback�s alt mode just isn�t that much fun. Kickback�s transformation, while quick, isn�t too interesting. All you need to do is unsnap the forearms, flip the insect legs back, and shift the robot arms up. Follow that with folding the insect legs, bend the knees slightly, flip open the helmet and twist the head around. An optional feature is flipping the wings upright to make him look more like his original toy, otherwise they can stay tucked back and either version looks fine. Kickback is slightly taller and leaner than his teammates. Robot details are present everywhere and molded features are done well � consistent with other Titans Return releases. As mentioned in grasshopper mode, the color palette is different than Shrapnel and Bombshell. The purple is really close to Shrapnel � only a slight shade different. Kickback as a good range of motion in the arms and legs, as all four joints are ball joints � the arms are particularly open for movement. Balance can be a slight issue with the wings hanging off his back, but a little care can mitigate any tumbles. The head is on a ball joint too, so you can move it all around and also get into some great flying poses. As for fun features, Kickback doesn�t really offer any. 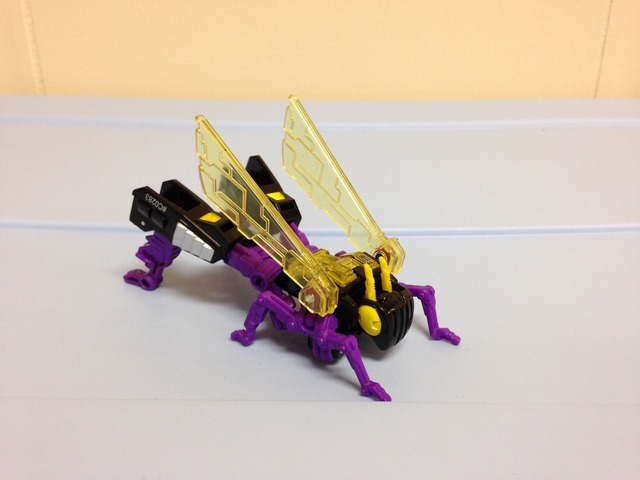 Aesthetically he looks good and fits in with his fellow Insecticons, but he doesn�t come with any weapons, nor does the robot mode have any Titan Master functionality that I can think of. It�s a shame too, because Kickback has some good potential, but honestly just doesn�t deliver much. Transformation Design: 6. It�s pretty simple, but not overly fun. It�s surprisingly close to the G1 toy though. Durability: 8. As thin as some of the parts are, they seem fairly solid. Fun: 6. I really wish this was higher, but honestly Kickback doesn�t offer a lot of play features. Aesthetics: 9. 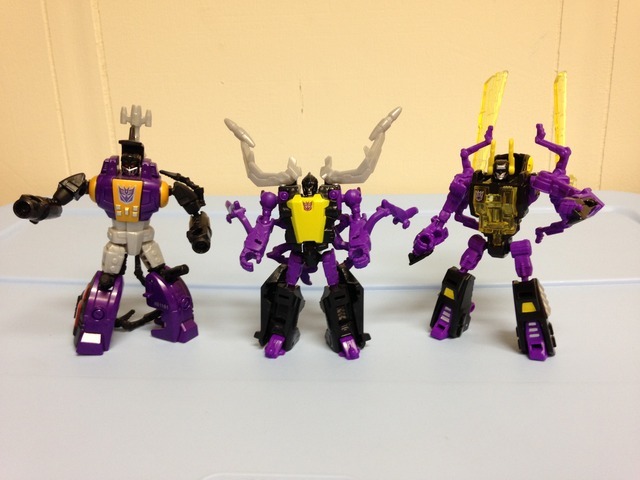 He fits in well with his fellow Insecticons, and I suppose that�s all you can ask for. Articulation: 8. He�s pretty dynamic for a little guy, and nothing is hindered. Slight balance issues in some stances. Value/Price: 7. At $10 USD MSRP, he�s OK. If there were more options for play, this would be a better score. Overall: 7. Overall, Kickback is a solid toy, and works really well with the other two Insecticons. He doesn�t offer a ton of play features, but his aesthetic works well and he�s got some good articulation. The bonus is that he�s rather inexpensive, so while he doesn�t do much, he won�t break your bank either.